Around the turn of the century Japan was a fascinating country in many ways. 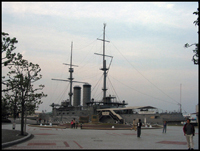 Most readers will have more than a passing knowledge of Japanese history, but it is useful to emphasize several points..
First of all, in 1900, Commodore Perry’s arrival in Tokyo Bay in 1854 was still in the living memory of many Japanese. In 1854 Japan had been a medieval feudal society, hardly touched by Western ideas. There had been some contacts of course, the story of the Dutch settlement at Deshima is well-known, but 99% of all Japanese had no knowledge of the world outside Japan. Forty-six years later Japan was a democracy, had railroads, heavy industry, hospitals, a telegraph system, and a disciplined and well-organized army, which had amazed the world five years previously by beating China in a fiercely-fought war. How had that been achieved? The leaders of the Meiji Restoration of 1867 were very determined to give Japan its rightful place in the modern world. They looked around and selected those ingredients that they thought were useful, while preserving their national and cultural integrity. Not all this was done deliberately, but at no time were the Meiji leaders prepared to indiscriminately swallow all that the West had to offer. They kept a cool head, and they borrowed all that could further their ends: for their new colleges and universities they employed teachers and professors from the West, until they had their own. They bought industrial knowledge, until they could stand on their own legs, and then they often produced better products than those they were modelled on. Still, all those modern developments were grafted on to Japanese society, they did not develop from within Japanese society. Japanese social life remained pretty much as it had always been. So from the start, from the last quarter of the 19th century onwards, there were really two Japanese realities: the modern, imported world, and the traditional world, and this dichotomy continued well into the 20th century, and has not completely disappeared, even nowadays at the beginning of the 21st century. The Meiji period leaders soon found out that once the doors to the Western world were open all kinds of thoughts, theories and ideas came in that were in favour of change instead of tradition. For, basically, the Meiji leaders were conservatives, and not in favour of all philosophies that the West had to offer. In 1901, for instance, they outlawed the newly founded socialist party. During the war with Imperial Russia, in 1904-5, Meiji efficiency and determination once more won the day. Now Japan was universally recognized as a modern nation. If the victory over China could have been regarded as a fluke, Russia was a modern, and more importantly, a Western nation, and the Japanese victory was in fact the first time in modern times that a Western nation had been defeated by a non-Western one. The UK had been quick to spot the importance of Japan: in January1902 the Anglo-Japanese alliance was concluded, establishing Japan as a world power. In the world of art the two worlds, the imported West and the traditional East were perhaps even more visible than in Japanese society at large. Here too the battle was fiercely fought. In the early Meiji period much traditional art had been abandoned in favour of imported art, until an American, Ernest Fenollosa (1853-1908) intervened successfully. He had come to Japan in 1878 at the invitation of American zoologist and Orientalist Edward S. Morse to teach political economy and philosophy at the Imperial University at Tokyo. There he studied ancient temples, shrines and art treasures. He did a great deal to make the Japanese realize the value of their art and their artistic tradition. At the same time that Western-style painting was taught in Tokyo the Tokyo Art School was established in 1889 with the express aim of promoting the study of traditional art. Already at the end of the 19th century Japanese artists had gone to Europe. One of them, the painter Kuroda Seiki (1866-1924) had made quite a name for himself in Paris, and his paintings had even been accepted in the Salon. When he returned to Japan in 1893, his example was quickly followed by others. One of the most important painters who made a long tour of Europe was Takeuchi Seihô (1864-1942). On his return in 1901 he even changed the Kanji of Seihô (incorporating the character for “West”) to indicate how profound the experience had been. Seihô’s development as an artist is very much a case in point. He had read Ruskin’s Modern Painters, and one of his paintings was exhibited at the Fifth International Exposition of Art and Industry in Paris in 1900, which was visited by Seihô himself. In the first decade of the 20th century Japanese artists were generally as well informed of developments in the European art scene as e.g. American artists. In 1907 the Ministry of Education decided to establish a kind of annual official exhibition, the Bunten, much in line with the Paris Salon. There were three separate sections: Western-style painting, Japanese-style painting and sculpture. Japanese-style painting and Western-style painting were kept strictly separate and possible mutual influences were officially ignored. It is important to emphasize at this point that most Sôsaku Hanga artists from this period thought of themselves primarily as painters, and many had in fact been trained as painters. Well-known in this connection are Yamamoto Kanae (1882-1946) , Ishii Hakutei (1882-1958) and Minami Kunzô (1883-1950). They, and other Sôsaku Hanga artists in this first and exciting period were profoundly influenced by the newest artistic developments coming from Europe, especially Art Nouveau. The first influential magazine, Hôsun, begun in 1907, was closely modelled on the German magazine Jugend, which first appeared in 1896. The members of the so-called Hôsun-group (named so in retrospective), were and are the most imortant Sôsaku Hanga artists from this period. Apart from the three mentioned previously we have Morita Tsunetomo (1881-1933), Oda Kazuma (1881-1956), Sakamoto Hanjirô (1882-1969) and Hirafuku Hyakusui (1877-1933). Interesting is that apart from the last-mentioned, all others were born within two years of each other. These were heady times for young artists. They were in the centre of a maelstrom of vastly different influences. They had to be eclectic and so they were. Allegiances shifted continually. In the literature Yamamoto Kanae’s print Gyofu – Picture of a fisherman, poublished in Ishii Hakutei’s magazine Myojo in 1904, is generally seen as the start of the Sôsaku Hanga (= Creative Print) movement. So much talent was bound to produce something relevant, and much more was to follow in the following years. Acknowledgment: for this and the other essays on this website I have made use of all the literature at my disposal (see my Reference Section), and I am profoundly grateful for all the fine work done by so many people. The division into decades was inspired by Donald Jenkins’ catalogue Images of a Changing World, Japanese prints of the twentieth century, a very important catalogue, published as long ago as 1983, and which was the first publication to open my eyes to the beauty of these prints.